British Airways is due to take delivery of its first Airbus A350-1000 aircraft in 2018, with 18 aircraft on order. You can see a picture of the new British Airways Airbus A350-1000 above. British Airways will be introducing a new business class seat on the Airbus A350-1000, but seeing as it is not awfully different from the current seat used on the Boeing 787-9 Dreamliner which I reviewed, it won’t be retrofitted throughout the the rest of their longhaul fleet. Instead, the offering adds small extras and has an improved yin yang arrangement. 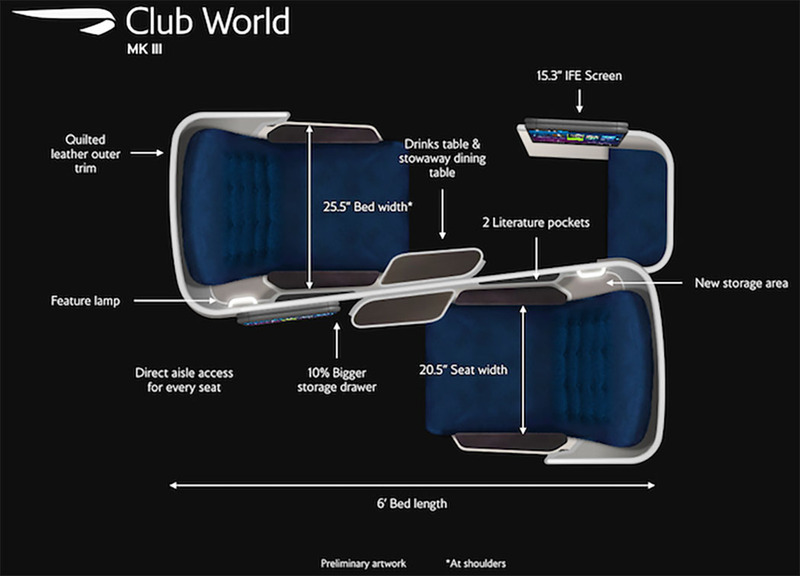 FlyerTalk member hemschmall posted the below image on FlyerTalk which gives an idea of the look and feel of this business class seat. The overall product looks to be a slight improvement. Usefully, passengers in the business class window seat no longer have to step over their neighbour in the aisle seats to get to the bathrooms. But British Airways business class is far from the best on the market, even with these improvements. This is not a top tier offering and there are airlines with better business class seats such as the Etihad Airways business class offering. That said, British Airways is the only airline offering the terribly British service which I rather like. With three Airbus A380s, 34 Boeing 787s and 18 Airbus A350-1000s on order, the British Airways fleet is changing. The 747-400 will however remain in service for some time, following the recent cabin refresh and refurbishment it has completed on these iconic planes. The refresh included new seat cushions in its World Traveler economy and World Traveler Plus premium economy cabins, and installation of Panasonic Avionics’ Android-based eX3 inflight entertainment (IFE) system throughout. By the end of 2016, British Airways will also be running 12 A380 Superjumbos which seat 469 passengers and which will fly to destinations including Hong Kong, Johannesburg, Los Angeles, Miami, San Francisco, Singapore and Washington DC. British Airways is due to take delivery of 16 787-9 Dreamliners, which are 20ft longer than its 787-8 predecessor, of which the airline has eight already in service. Other new planes planned in for British Airways include thirteen A320 NEOs and seven A321 NEOs, both to be delivered between 2018 and 2019. If you enjoyed this article you may be interested in my other airline reviews and airport lounge reviews.